You help win campaigns for clean air, water and land, which will ultimately lead DFW toward a more sustainable future. Learn more about our local efforts here in the DFW Metroplex! Zero Waste is a strategy that includes market-based and policy objectives that aim to reduce wasted materials in our economy. In practice, Zero Waste plans take a holistic approach—minimizing inefficiencies in every step along the commodity chain—to reduce landfilling and incineration by up to 95%. You can read more about Zero Waste here. According to regional research, the DFW area recycles about 22% of the materials we use. This is significantly less than the national average of about 34%. While there are clearly many opportunities to increase regional recycling, we recognize the dedicated advocacy and hard-fought victories that have brought us this far. The Cities of Dallas and Arlington only started offering curbside recycling after tens of thousands of petitions were gathered by committed residents and community organizers. We will need sustained pressure on local officials throughout the Metroplex in order to reduce our environmental impact and keep up to 95% of valuable materials out of the dump! 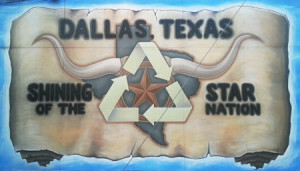 TCE has active campaigns to expand access to recycling in Dallas, Denton, and Arlington. We are also working with residents and city officials in Plano, Richardson, and other cities throughout North Texas. Multi-family buildings are home to a majority of DFW residents—and in most cities, it’s currently up to each apartment building owner or condominium association to decide whether to provide recycling access for residents and tenants. The majority of wasted resources that end up in local landfills come from commercial, multi-family, and construction and demolition sources. Therefore, cities should work to implement policies and programs that provide recycling to everyone, no matter where they live, work or play. Some Texas cities such as San Antonio, San Marcos and Austin have already adopted commercial recycling policies. 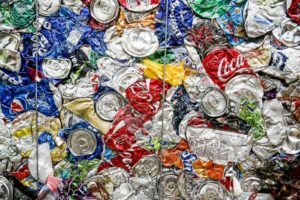 Here in North Texas, Fort Worth, Euless, Allen, Lewisville, Little Elm and Cedar Hill have started comprehensive multi-family recycling programs through franchise agreements. Dallas finally passed a policy for universal apartment recycling in 2018, which goes into effect in Jan 2020. We can learn from these examples to implement comprehensive recycling in other cities. Through grassroots organizing, advocacy, and public opinion and policy research the DFW Zero Waste Alliance is working to create a more circular economy for North Texas. You can join our efforts here! 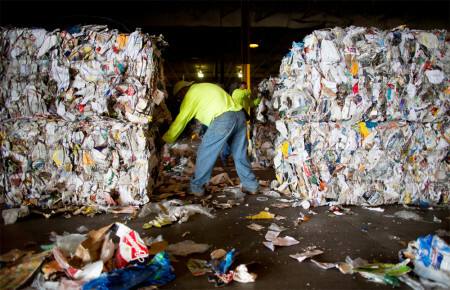 Dallas: We want composting and reduced trash bills! All Dallas residents pay the same monthly fee for trash and recycling no matter how much trash they discard. Households that produce just one or two bags of trash weekly are paying the same amount as those overusing the bulk trash program and filling their bins to the brim. Dallas households that produce less trash are simply overpaying for city services. More than one-third of the residential trash bill in Dallas goes toward costs associated with the optional bulk trash and brush collection program. One city survey found that 27% of households did not even use this program over a six-month period—despite paying over $100 annually to pay for it. Dallas should give its residents the ability to pay less for trash services when those residents produce less trash. Dallas should also make changes to its bulk and brush program to ensure we are maximizing the use of compostable materials, which can be reused in parks, gardens, and farms. 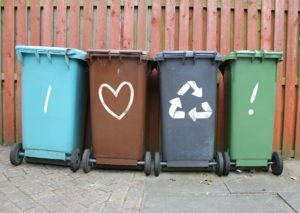 Denton: Expand recycling and composting not the landfill! The City of Denton filed a permit application with the state environmental agency (TCEQ) to expand its landfill over 200 feet high. This proposed permit is getting close to completion, and we’re asking Denton residents to let the city council know that we would rather recycle and reduce our waste than keep growing the landfill. The vast majority of Denton apartments and businesses to not have basic recycling services, and these establishments produce a large portion of the city’s waste footprint. Denton also imports enormous amounts of trash from nearby cities and businesses. Imported trash is disposed at a discounted rate, so residents within the City of Denton are actually paying a lot more to dispose of trash than those living outside the city. Denton could greatly reduce its landfill impact by making adjustments to trash import prices, and expanding waste reduction, recycling and composting services that are offered within the city. Sign this petition to let Denton city leaders know that you support Zero Waste policies, reduced trash imports, and that you do not want a trash mountain to be permitted in the city! Arlington: Expand recycling to all apartments! Arlington City Council passed an ordinance in June 2018 that ensures all new apartment buildings will provide recycling to multi-family residents, almost 20 years after providing recycling services to Arlington single-family neighborhoods. The council’s recycling policy doesn’t apply to any apartments built before 2018–where more than 100,000 residents already live. We are asking Arlington officials to expand recycling no matter where people live, including all apartment buildings. Sign this petition to send a personalized message to the Arlington Mayor and City Council to say we need recycling for all existing apartment residents. Also, tell them we need to begin composting the residential brush materials that are set out in neighborhoods instead of dumping them in the city’s landfill!